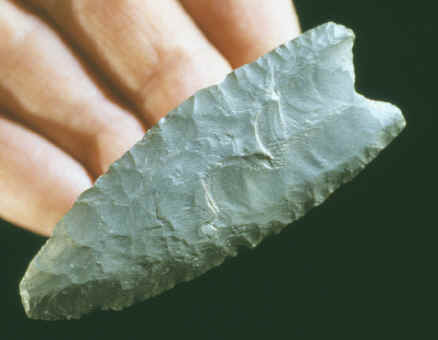 This Clovis point was found in 1975 near Fairfax Circle, Virginia in Accotink creek. It's a good example of an early paleo-Indian fluted projectile point from this area. This Clovis point has two side-by-side channel flake removals on one side. The other side has a single long narrow channel flake that was partially removed from further basal thinning and shaping. This spear point was probably resharpened one or more times. The longest flute measures 1 3/8 inches (3.4 cm) long. This Clovis point is made of green Normanskill chert and it measures 2 7/8 inches (7.3 cm) long.